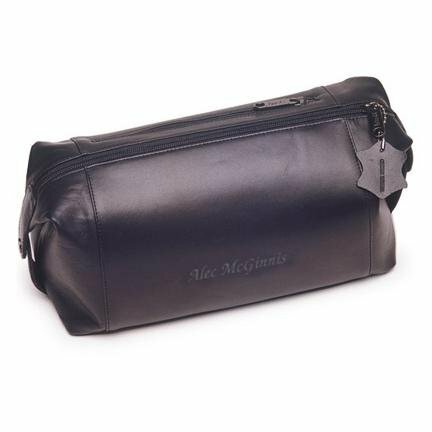 This personalized leather toiletry bag will always comes in handy for a man who travels away from home. The bag is constructed of quality black leather and is lined in nylon for durability. It features engraved personalization. A great way to organize all the items needed for personal care. Give as a gift for a special occasion or to commemorate a celebration such as a wedding. Each toiletry bag measures 11.5" x 5" x 5.5" and is gift boxed.